Situated on the SE coast of Cornwall only 1.5 miles from the pretty fishing town of Looe. 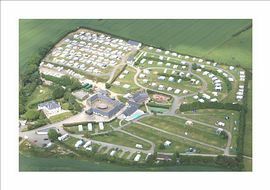 Tregoad Park is the ideal place from which to explore this beautiful part of Cornwall. 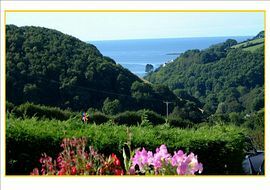 The park is well away from the road at the end of a private driveway and it has great views to Looe Island and the sea beyond. Facilities include: an indoor heated swimming pool and Jacuzzi Spa, open all year. Bar and bistro open mid and high season, on-site shop, laundry, games room, kids play park and football-kite field. We welcome well behaved dogs and have a dedicated dog walk area. 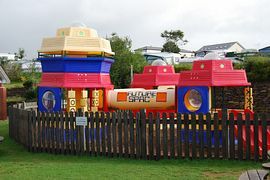 Tregoad Park is great for out of season quiet breaks or fun filled high season holidays. Pitches are terraced, flat and level and we have the option of grass or hard-standings. 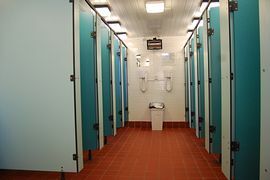 Shower blocks are modern, clean and heated in the winter months. The park also benefits from full Wi-Fi coverage. Cornish attractions such as Eden, Heligan and the coast path walks are all close by. For more information please check out our website. Indoor Heated Swimming Pool and Jacuzzi Spa (open all year). By Car: from Plymouth follow A38 to Trerulefoot r/b. turn left for Looe the turn right onto A387. Follow through Hessenford and Widegates. Road changes to B3253. Follow through No Mans Land and Tregoad can be found on the left at the bottom of the hill. Touring Electric Pitches from £19 to £35 (based on unit + car + 4 people. Tents from £7 (tent + 1 person, low season). Tents to £32 (tent + 4 persons, high season).